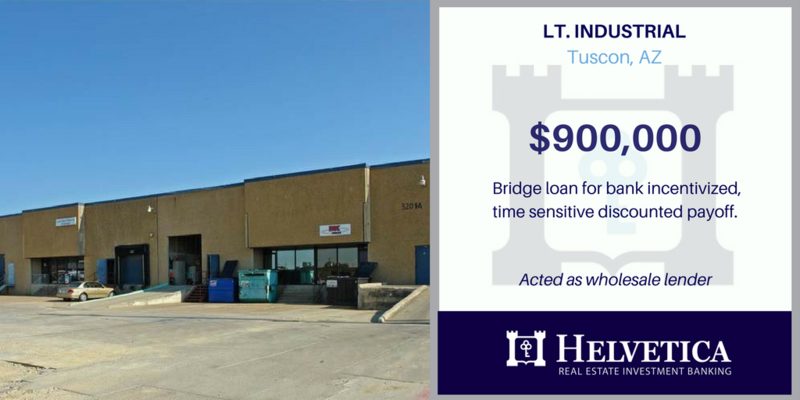 MESQUITE, TX - Helvetica was approached by a multi-national brokerage firm in search of another low LTV bridge loan for their client, who Helvetica had financed one year prior. The opportunity to work with with repeat borrowers, and a reputable brokerage firm, gave Helvetica great confidence that the deal would get done. The borrowers owned a muti-tenant industrial property in Mesquite, TX that had an existing note with an upcoming maturity date. The borrowers intend on selling the property but want to get occupancy near 100% before they sell. 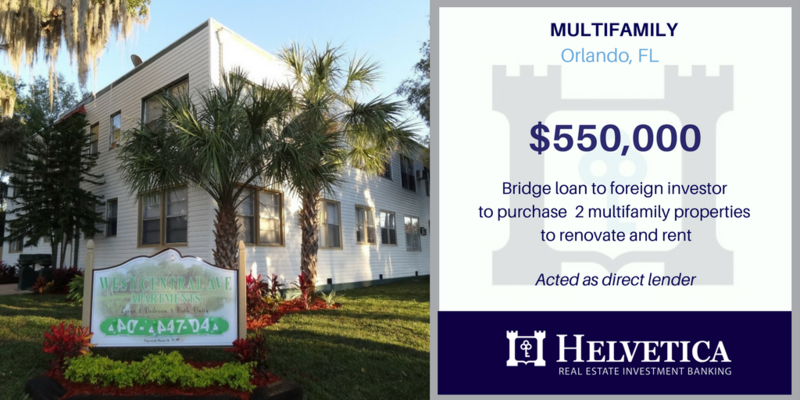 Through great coordination with the brokerage firm, Helvetica was able to quickly provide the borrowers with a 12 month bridge loan. With Helvetica’s $900,000 loan, the borrowers were able to pay off their existing note right before the maturity date. The owners will now have more time to fully lease up and stabilize the asset in preparation for the sale. Helvetica welcomes the opportunity to work with brokerage firms to assist with their clients' financing needs. 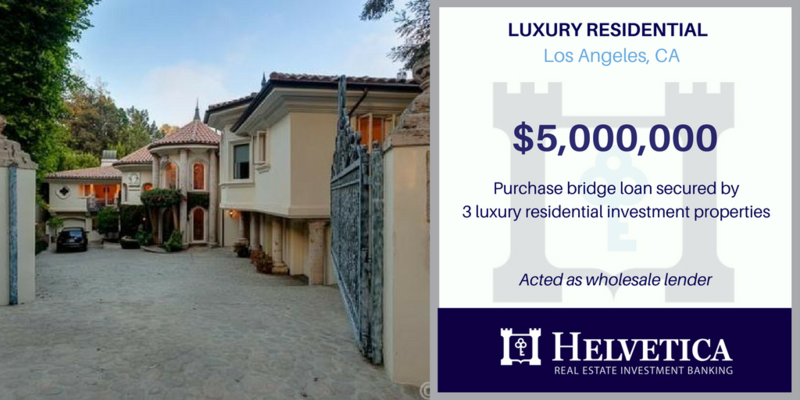 BEVERLY HILLS, CA - Helvetica funded a $5 million bridge loan to facilitate a reverse 1031 exchange. The borrower was in escrow to sell a house in Beverly Hills, CA, but needed to quickly close on the purchase of another single family investment property which qualified for their 1031 exchange. Loans That Match Lender Guidelines = Faster Closings! 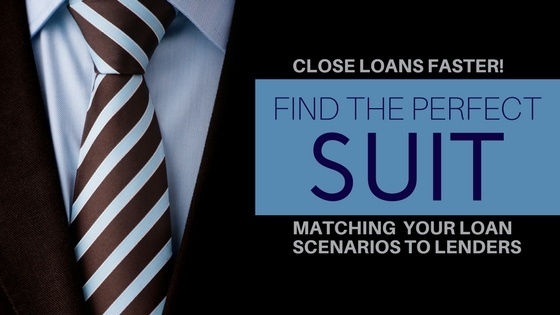 One of the hardest jobs that a loan broker has is "matchmaking" their client's loan request with the right funding source. Additionally, one of the biggest setbacks to closing loans quickly is having a lender decline a loan, requiring that the process begin again with somoene new. 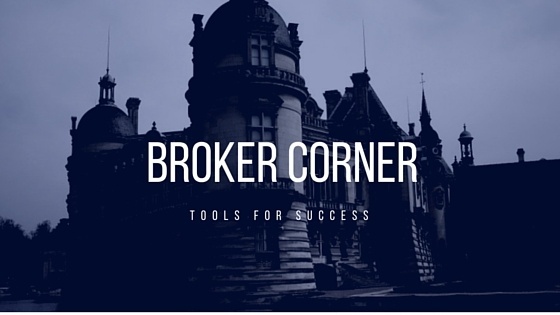 With these two challenges in mind, you can see how vitally important it is for the broker to understand the client's loan scenario, as well as potential lender's guidelines for approval as early as possible in the process. 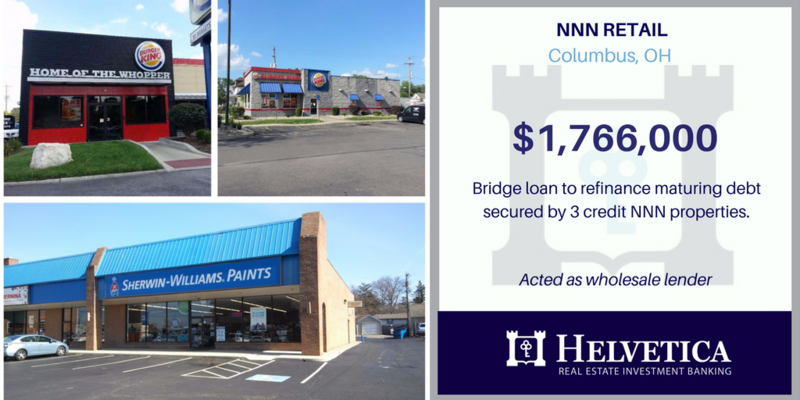 COLUMBUS, OH - Helvetica funded another broker originated $1,766,000 bridge loan to refinance and consolidate maturing debt on three NNN retail buildings with complex title issues . The subject collateral consisted of two Burger King restaurants and one two-tenant retail building which featured Sherwin Williams as the anchor tenant. HINSDALE, NH - Congratulations to Jaden Jeter for closing a $2,700,000 commercial real estate bridge loan in Hinsdale, NH. 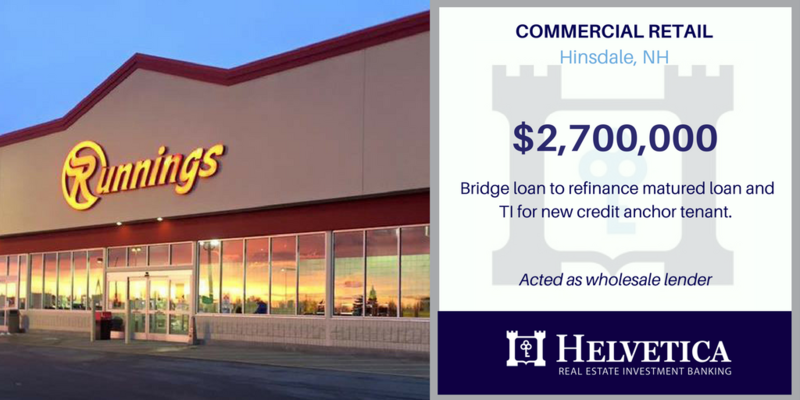 Helvetica funded the refinance of a matured loan and financed the TI for a new credit anchor tenant in a 122K square foot retail center. High vacancy, lease expirations, speed of execution, seasoning and DSCR hurdles prevented this borrower from getting conventional financing. We continue to fund the #unbankable. Reach out to discuss your difficult commercial real estate loan. 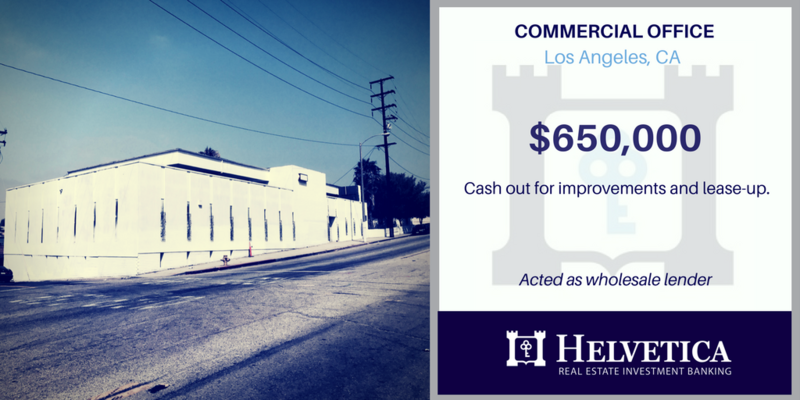 LOS ANGELES, CA - Ben Wilson, Director of Lending at Helvetica Group, provided another bridge loan to an unbankable loan scenario. The borrowers owned the property free and clear and needed a cash out refinance to payoff high interest business debt. The property was vacant and didn't quality for a bank loan. The cash out provided by the Helvetica bridge loan provided an opportunity for the borrower to make cosmetic property improvements in order to offer the building for lease. Once stabilized the borrower expects to refinance into a more traditional commercial loan. 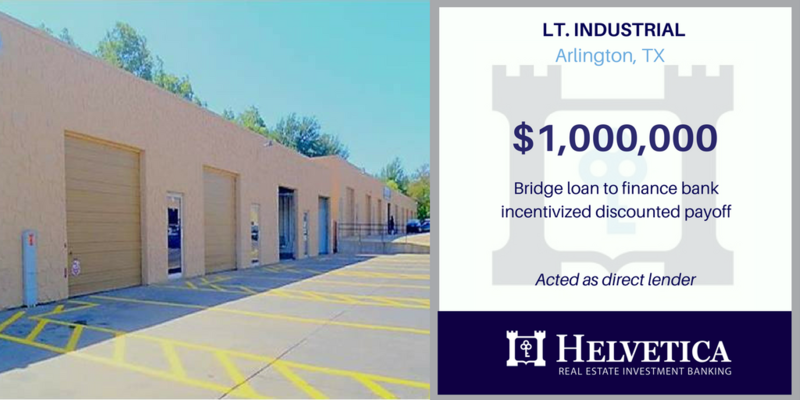 ARLINGTON, TX - Helvetica was approached by a multi-national brokerage firm in search of a low LTV bridge loan for one of their clients. The borrower had been approved for a discounted payoff on their asset. The property was experiencing below market occupancy, and lender restrictions were handcuffing the borrower's leasing efforts. Through great coordination with the brokerage firm, Helvetica was able to quickly provide the borrowers with a 12 month, $1,000,000 bridge loan which allowed the borrower to take advantage of the lender's proposed discounted payoff. With Helvetica’s loan, the borrowers will have more flexibility to lease up and stabilize the asset. DAYTONA BEACH, FL - The Helvetica Group announced the funding of a purchase loan for two multi-family properties in Florida. Helvetica’s cross collateralized bridge loan financed 55% of the total acquisition cost. The first property was a 14-unit apartment complex in Daytona Beach, and the second property was a 10-unit multi-family building in Winter Haven. 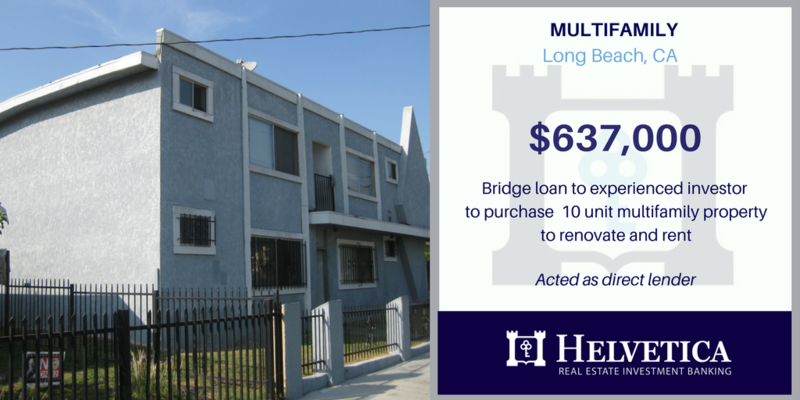 LONG BEACH, CA - The Helvetica Group announced the funding of a purchase loan for a multi-family property in Long Beach, California. Helvetica’s loan was a secured by a first trust deed and covered 65% of the total acquisition cost. The property is a 10-unit, 6,000 square foot apartment building that was 70% occupied and collecting below market rents. The borrower acquired the property with the intent of adding value by leasing up the remaining vacant space and increasing rents. Once stabilization efforts are finalized, the borrower intends to sell the property and payoff Helvetica's bridge loan. Organization: The Key to Closing Commercial Real Estate Loans Faster!